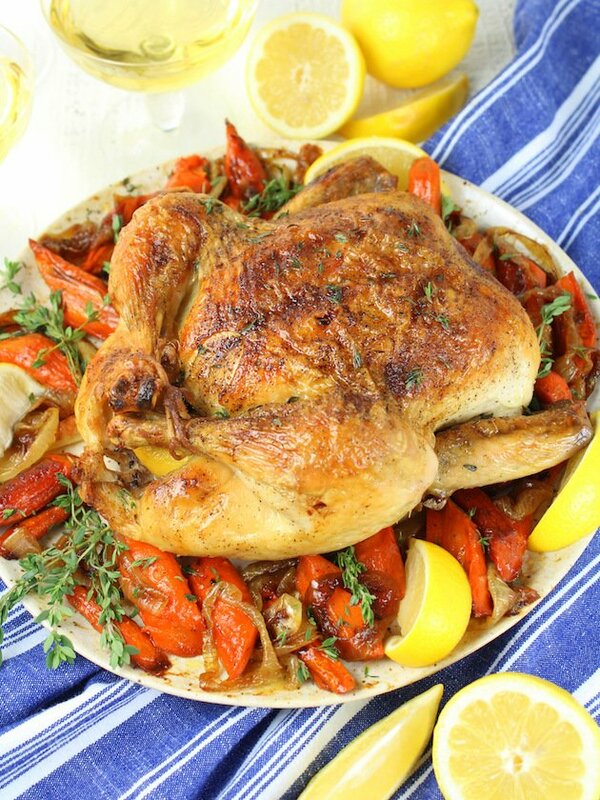 This Lemon Thyme Oven Roasted Chicken should be a staple in your weeknight dinner rotation! The meat is tender and juicy while the skin stays golden brown and crispy! It’s the perfect recipe for a family Sunday dinner or easy entertaining with friends! My girl Ina Garten (aka Barefoot Contessa) has never let me down. Literally, I’ve never made a recipe of hers that I didn’t love. Plain and simple: she is my gurl! 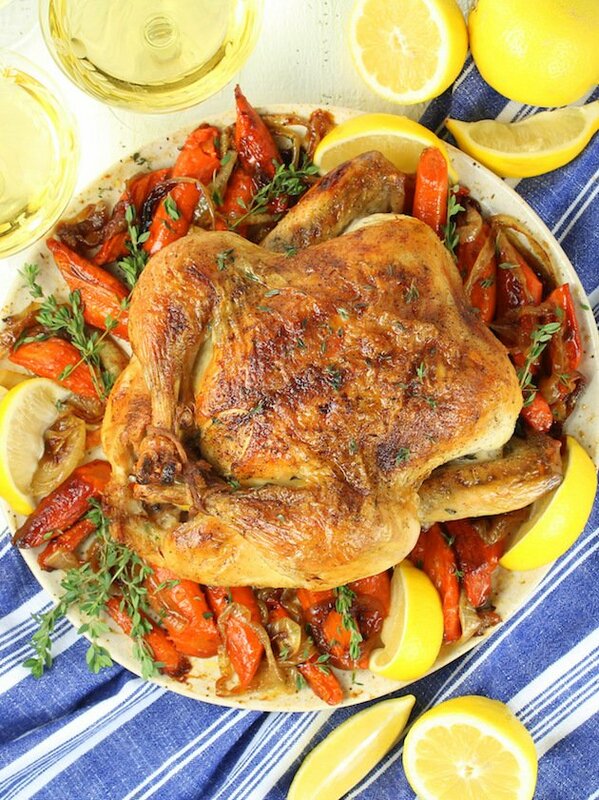 So, when I returned from a whirlwind trip at 1am, and was having dinner guest that same night, I knew what needed to happen…a Roasted Lemon Thyme Chicken! The obvious choice – amiright!? I grabbed my gurl’s cookbook – Barefoot Contessa at Home – and went to work. What’s the best chicken for roasting? The recipe calls for a capon, which she delicately describes as a rooster that has been altered to become a hen. Basically, they are larger than a typical chicken (about 8-10 pounds) and are great to serve if you’re having a few friends over for dinner. Or if you want leftovers to meal prep for the week! My grocery store didn’t have the capon, so I substituted it for 2 whole chickens. The recipe says to salt your chicken and wrap it in plastic wrap for up to 2 days. Umm, I don’t have 2 days let alone 2 hours. So, I salted my birds, wrapped them up, and let them sit for about an hour in the refrigerator. 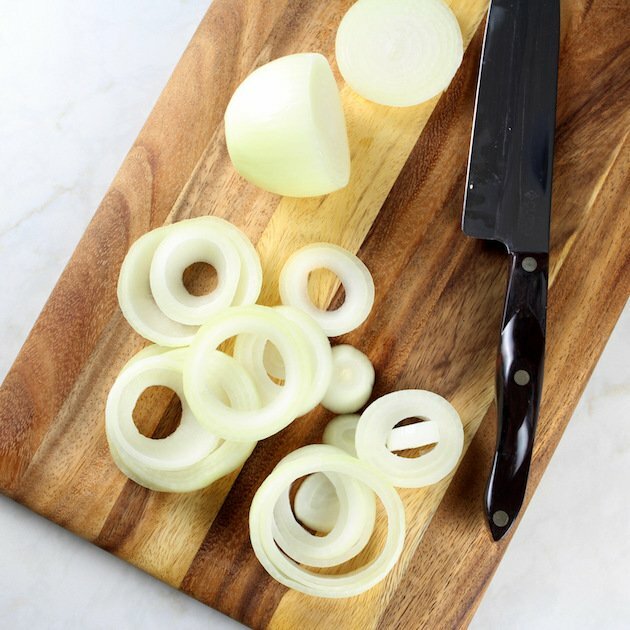 While cut up my carrots and lemons, chopped my thyme, and sliced my onions. 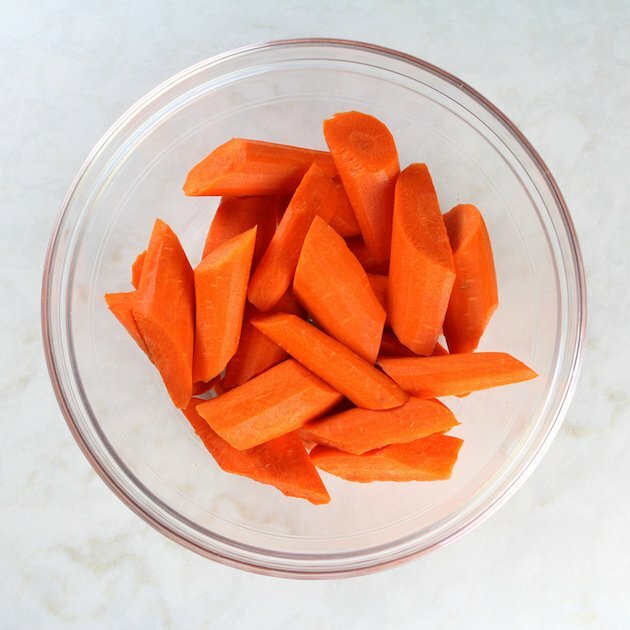 I melted two tablespoons of butter, added it to the carrots, onions, salt, and pepper and gave it all a toss. I patted down the chicken with some paper towels to remove any excess moisture. I sprinkled the inside of the chicken with salt and pepper, added the thyme and the lemon wedges (4 per chicken) to the inside cavity of the chicken as well. I tied the legs together with kitchen string and tucked the wing tips under the body of the chickens. Then I placed my whole chickens in the roasting pan and brushed them with 2 tablespoons of butter and a sprinkle of pepper. Next I placed the carrots and onions around the rest of the pan. Then into the oven it all went and 90 minutes later I was rewarded with the most heavenly smell wafting through my house. Mmmmmm! It makes my mouth water just thinking about it! You may be interested to know the rest of my down and dirty dinner menu that night, it included; White Wine Gravy (see recipe below), the most scrumptious Roasted Fall Vegetables, a delightful Autumn Salad and a Salted-Butter Apple Galette with Maple Whipped Cream. What can I say – this girl is on fire!! 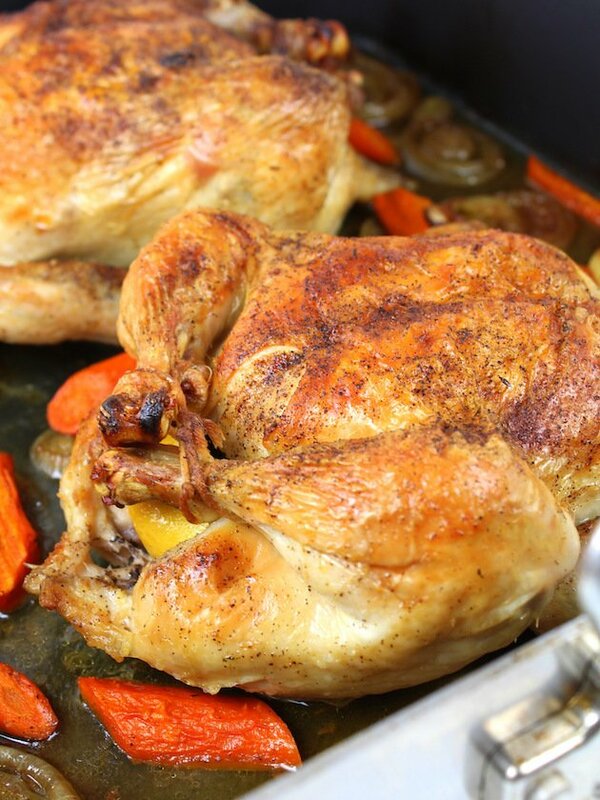 There are so many wonderful things about this oven roasted chicken recipe… It doesn’t require a fridge full of ingredients, it’s not too difficult to assemble, and the meat turns out tender and juicy while the skin stays golden brown and crispy. You gotta love that crispy skin!!! Plus, the oven roasted veggies and gravy are a nice addition to the meal as well. What are you waiting for? ?… Invite some friends over and get cooking! You can swap out the thyme and make a Rosemary Roasted Chicken instead. If you don’t care for dark meat, swap out chicken breasts instead. Roasted bone-in chicken breast would turn out just as delicious with the same crispy skin. If time is not an issue you could always try Ina Garten’s original recipe which says to salt your whole chicken, and wrap it in plastic wrap for up to 2 days in the refrigerator. I always recommend using a digital meat thermometer to confirm you’ve reached the right cook temp! 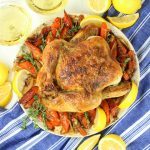 Lemon Thyme Roasted Chicken - So many wonderful things about this roast chicken recipe…it doesn’t require a fridge full of ingredients, it’s quick and easy to assemble, and the meat turns out tender and juicy while the skin stays golden brown and crispy. Remove the chicken giblets. Rinse the chickens inside and out. Remove any excess fat and leftover pin feathers, and pat the outside dry. Liberally salt the outside of both chickens, cover with plastic wrap and let sit for 1 hour in the fridge. 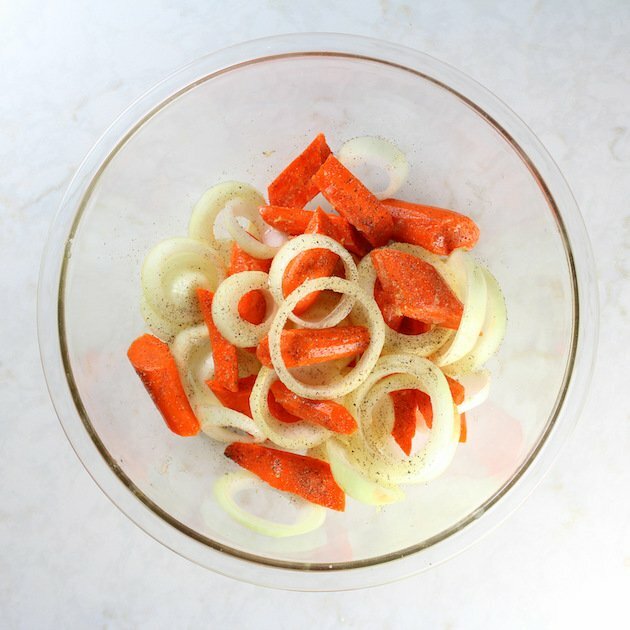 Meanwhile, cut up carrots, slice onions, quarter the lemons, & chop the thyme. After an hour, preheat the oven to 425 degrees F. Remove the plastic wrap and pat the chickens with paper towel to remove all excess moisture. Sprinkle the inside of each chicken cavity with salt and pepper, then add thyme and quartered lemons (4 lemon quarters per chicken) to the cavity as well. Tie the legs together with kitchen string and tuck the wing tips under the body of the chickens. Place in the roasting pan, then brush the outside of the chickens with 2 tablespoons of melted butter and sprinkle with salt and pepper. Place the carrots and onions around the rest of the pan. Roast the chickens for 1 1/2 hours, or until the juices run clear when you cut between a leg and thigh. Use a meat thermometer to be sure the internal cook temp has reached at least 165F. 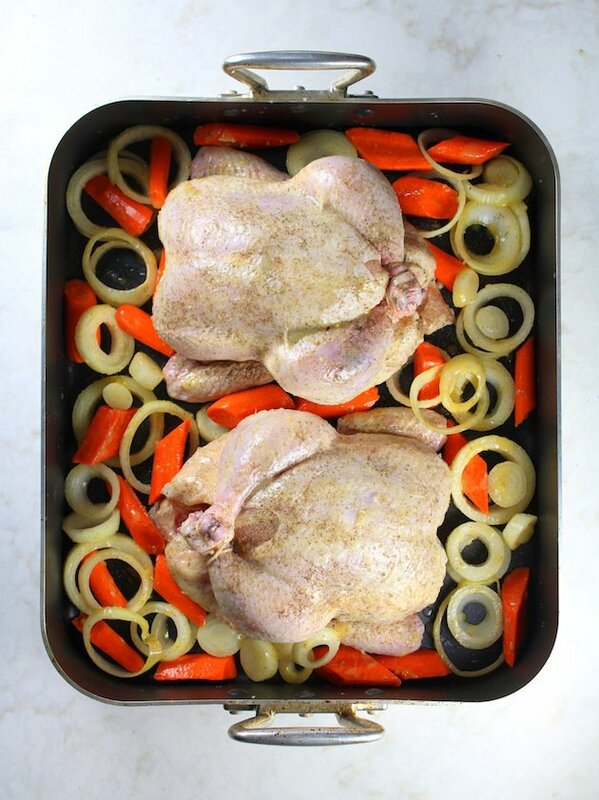 Remove the chickens and vegetables from the oven. 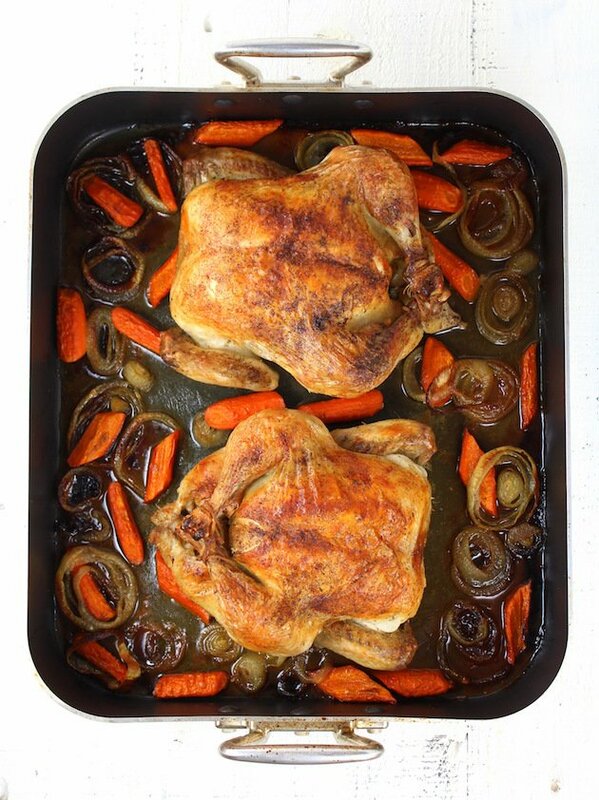 Allow the chickens to rest for 15-20 minutes, carve and serve on a platter with the vegetables and gravy if desired (see recipe below). 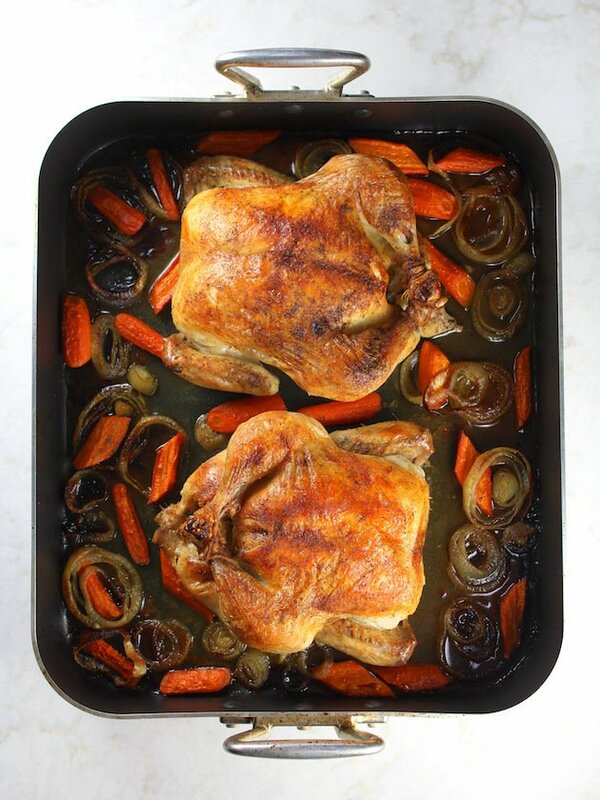 Because I’m a saucy girl, I cannot pass up the opportunity to make a rich, silky gravy from the pan juices of this roasted chicken and veggies. And keeping with our quick and easy theme – it can be whipped up in about 10 minutes. Enjoy! Pour the pan juices into a sauce pan and cook on medium high. In a small mixing bowl add 2 tablespoons of flour and 2 tablespoons of room temperature water and stir together. The mixture should be a little runny. Slowly whisk the flour mixture into the simmering pan juices. Keep whisking until there are no lumps then let cook for 3-5 minutes. The color of the gravy should darken a bit as the flour cooks. Slowly whisk in ½ cup white wine and let simmer for another 2-3 minutes. You may need to add a little salt and pepper depending on your taste. 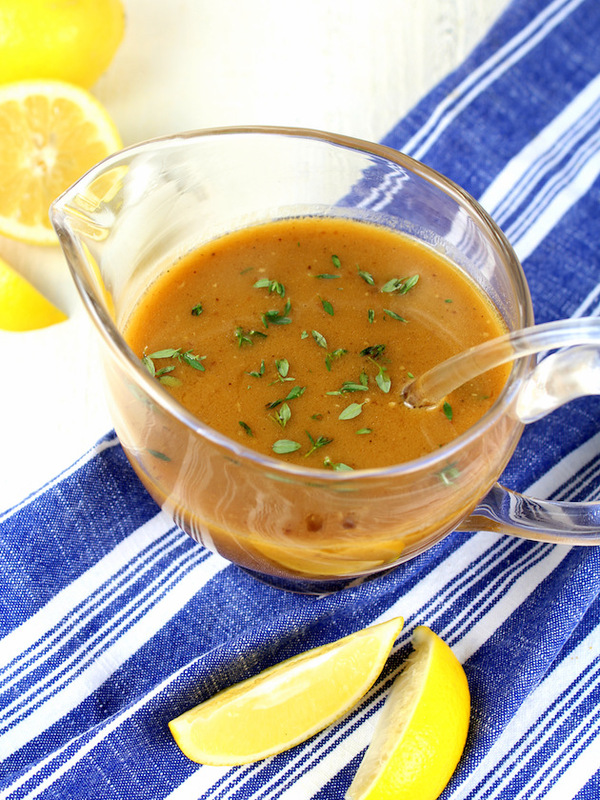 *If the gravy gets to thick stir in a little water, chicken stock, or more white wine . « Chicken Sausage Weeknight Dinner Recipes + Instant Pot Giveaway!! This is absolutely delicious! And the carrots and onions don’t even make it to a plate! YUM! Thanks so much, Jaime! It’s such a simple recipe but sooo good! How good does that skin look?! Gleaming and golden – wow. The veggies look great and the white wine gravy sounds perfect. Lemon and thyme, both my two favourite ingredients. When used in any recipe can’t go wrong. Such a fresh and delicious looking dish. LOVING the fact that this deliciousness comes together all in one pot, such great flavors! One-pot for the win! Thank you, Donna! OMG! My mouth is already watering just looking at the pictures of this chicken! Definitely saving this recipe to make it sometime soon! Yayyy! Love that so much! Such a classic flavour combo! It is a recipe I love to make every week. Now that is one beautiful bird. Such a gorgeous color and I’m glad you added the veggies on the bottom. Will enrich the juices on the bottom. We love the touch of lemon with our chicken and thyme is such a great compliment to the bird. Great recipe. Lemon and thyme is such a winning combination! You just can’t go wrong with it. 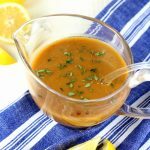 Lovely recipe and that gravy looks amazing! Gorgeous photos! And your recipe looks amazing! I love using lemon and herbs for chicken!! Always makes it taste the best! Absolutely, Anna! I feel the same way! And thank you! Oh, you had me at lemon. 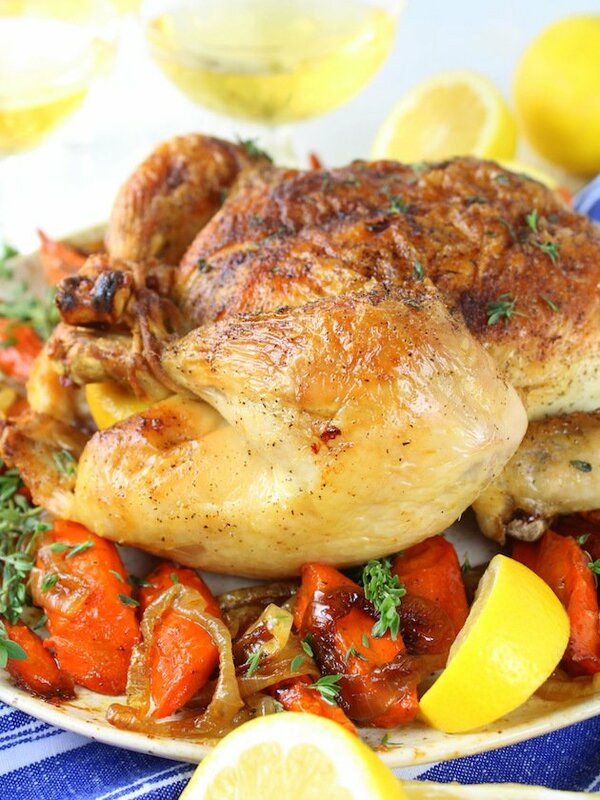 I love the flavor of lemon on a roast and baked Chicken dishes. This sounds so delicious. Saving for later. Mmmmm this looks excellent. A meal that I can stretch throughout the week. Thanks for the inspiration. Lemon and thyme are one of my favourite combinations. What a great recipe, and that white wine gravy looks delicious! Yum! 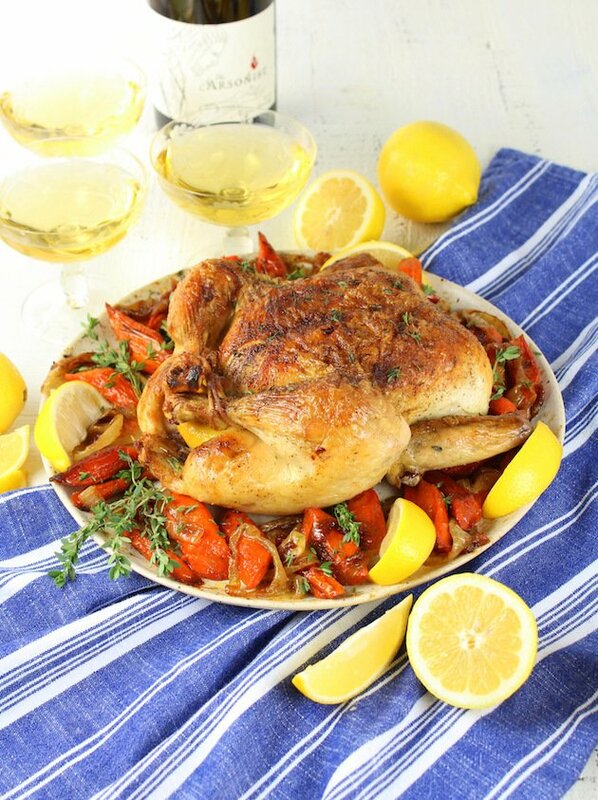 I love chicken with lemon but I never thought to roast a chicken with lemon! Well, that changes now! Your recipe looks delicious and easy! !